This being the case, it’s been a semi-regular part of my riding since I got back on the bike in January 2012. Back then, of course, I had fortnight legs*, so it was very nice to have a relatively low-speed stretch of flat-ish path, away from traffic. I used it a lot. It has things wrong with it, but what doesn’t? But lately, there’ve been a few changes, around where the cycleway meets Broughton Street in Canterbury. The railway line is carried overhead by bridge. The cycleway joins the road to pass under this bridge. It’s the width of two traffic lanes. Originally, cycleway users would execute a merge with the road at A, then de-merge back onto the cycleway at B – or vice versa. This wasn’t much of a big deal. Broughton Street is a road to nowhere, and I can count the number of times I’ve seen a car on it on one hand. That includes the times I’ve driven it myself. Which is once. The sight lines weren’t ideal, but there’s also a merge point at ‘C’, which has a better line of sight. Anyhoo, a few months back, I noticed that Canterbury Council had erected a temporary barrier between A and B, separating the cycle – and foot – traffic from the (almost non-existent) vehicle traffic. I sighed and just took the road as I always do. 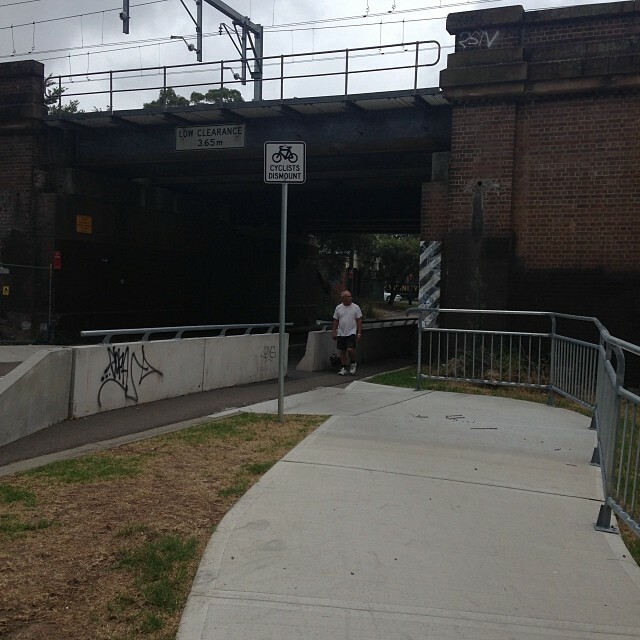 In time, the temporary barriers were replaced by more permanent concrete barriers, with a handrail. I rolled on through a couple of times, noting with interest that slap in the middle of this new barriered ‘cycleway’ section was a drain cover sized just right to swallow up the front wheel of a road or commuter bike, sending the rider first over the bars, then later to the bike shop for a new wheel. In time, someone realised what they’d gone wrong with the drain cover, and replaced it with a more safe version. Which is good. I guess. But they also realised that they’d screwed up in making the section inside the barrier too narrow. So how did they fix it? Yes, that’s right, step three. They put up a sign telling riders to dismount. This, dear reader, is what cyclists have to put up with. Incompetents disguised as cycle infrastructure planners. And don’t even get me started on the “warning: slippery paint” signs that appeared in the Wilson Street Cycleway over the Xmas break. Thankfully, they’ve been noted and rectified, my contacts tell me. But really? Who paints a cycleway with slippery paint and then, instead of oh, I dunno, repainting it with not-slippery paint, puts a sign up saying “oops, we’re idiots, please don’t break your necks because of our incompetence”? To close out, my solution? I would make Broughton and Charles Streets a one-way loop, and reduce the (non-existent) traffic to one lane. I would then repurpose the saved lane to continue the cycleway in a safe width, allowing cyclists and pedestrians – who vastly outnumber the vehicles here – safe passage. UPDATE: I’m informed that officially, this is Charles Street. It’s not clear to me where Charles becomes Broughton, but there you go. Also, here’s a pic of the drain cover that was, from another thread on Sydney Cyclist. * too weak ones. Geddit? Sydney cycleway planning is completely incomptetent at the best of times. It is clearly designed by people who consider cycling 10km on a sunday morning over an hour with a small child the maximum conceivable usage. If you are out for a leisurely ride sure, dismounting and getting around a needless obstacle isn’t a big issue. Walking up the steps of the harbour bridge, contesting with randomly ending bike lanes, trundling over the pyrmont is a mild inconvenience. If you consider cycling as a practical form of transport (which every cycle commuter in Sydney does) all of a sudden you have millions of dollars of infrastructure which is wildly unfit for practical usage. 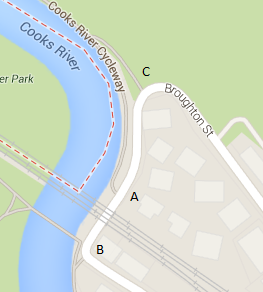 The cooks river is a great path for casual riders, it meanders, is narrow and shared. But for a commuter travelling 35-45 km/h it is downright dangerous, add in rain and the slippery pebble sections become even worse. The dismount section isn’t the only stupid decision on the path, the wooden bridge near Marrackville, the section through tempe where the path is submerged once every few months all reveal the reality – that cyclists are the lowest priority when developing infrastructure. To use the path you have to be willing to ignore the ‘cycleway’ and detour around the path to safely get anywhere! So what is left to do? Ride on the road and deal with arrogant, distracted and incompetent drivers? Stick to tedious and slow cycleways (e.g. going down kent st cycleway in afternoon peak is painfully slow compared to shooting down clarence) or even actively dangerous (Bourke road and the trucks reversing out of driveways onto the cycleway)? Even the best bits of infrastructure are frustratingly slow, bourke st cycleway lacks light syncing so getting run of greens is a very rare occurrence. Wilson st was repainted using grip-free paint ON A HILL. It is absurd! It seems to me if you are a cyclist who wants to achieve anything at all, be it getting somewhere or training or longer riding you have to shoulder risk to do so. It all seems very unfair especially with the number of commuters and sport riders growing. I totally agree. I commute from Dulwich Hill to Rhodes every day. I have given up using the ‘cycleway’ and ride on the road now. It’s much, much safer. I would note that the Broughton street problem is probably due to the fact that it’s on a bus route. If you’re crossing to the path near the corner and the bus comes thru at it’s usual speed (ie slow enough not to tip over) then you’re toast. I’ve had more than a couple of frights. The main reason I stopped riding here was the dogs and the dog walkers. It’s not a cycleway, it’s an offleash dog walking path.